J.B. Muns, Fine Arts Books was founded in Los Angeles in 1964. Fresh out of USC's School of Music, and having worked in the Doheny Library & Music Library there, she began toying with the idea of becoming a Music Librarian. But a rare opportunity arose for Muns that changed her focus to becoming a bookseller: "After all, I had a handle on how the institutions worked by this point, and I thought I would like selling to them. This worked out better than I ever imagined - until their budgets changed..."
By 1980, Muns felt that she also wanted to explore a new field and branched out into classical Music Autographs, thereby changing the business name to reflect this: J.B. MUNS, FINE ARTS BOOKS & MUSICAL AUTOGRAPHS, incorporating more of her musical background into this venture. Muns finds her dealings with the public and working out of her home most stimulating: "Collectors who know more about what they specifically collect teach me a lot. And at this point, they are from all over the world, making business even more exciting!" Her business is by mail order, working alone and an occasional book fair or autograph show, being helped by her husband, an architect by profession. "He also enjoys meeting and selling to the public," she adds. By 1989, Muns began a resource for musical signatures for her own use. "I thought if this helped me decipher names, it could also be valuable to other collectors. So I self-published guides. They have been well received. One day I would like to incorporate them into one volume with one alphabet, to make them easier to use." 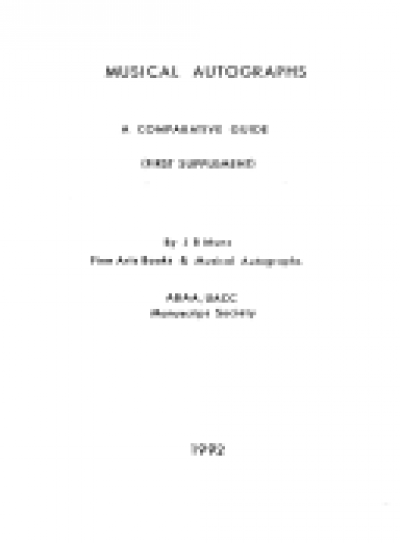 The guide, called MUSICAL AUTOGRAPHS: A COMPARATIVE GUIDE, lists over 1000 signatures of classical musicians & may be ordered directly from J.B. Muns through postal mail. In closing, Muns says: "I love my work and have never considered doing anything else. I try to educate and stimulate individuals every chance I get. This should be what business is about."